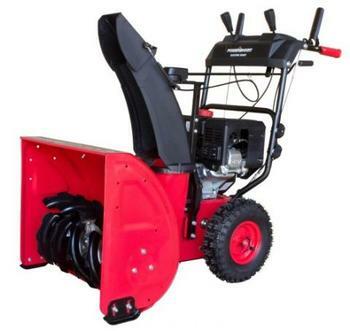 Amerisun of Itasca, Ill., is recalling about 46,000 PowerSmart snow blowers sold in the U.S. and Canada. The firm has received 20 reports of loose pulley bolts -- 15 in the U.S. and five in Canada -- including eight reports of the snow blower getting stuck in drive mode. No injuries have been reported. This recall involves model years 2015 – 2017 Amerisun PowerSmart gas-powered 2 Stage snow blowers. The snow blowers are red and black and have “ POWERSMART ” printed on the driving controls plastic cover. The model number can be found on the PowerSmart sticker located on the metal auger housing just below the chute. The serial number can be found on the bar code sticker below the PowerSmart sticker. The snow blowers, manufactured in China, were sold at Home Depot stores nationwide and online at Amazon.com, Ebay.com, Homedepot.com, Lowes.com, Walmart.com, and other websites from July 2015, through February 2018, for between $500 and $800. Consumers may contact Amerisun at 800-791-9458 from 8 a.m. to 5 p.m. (ET), by email at support@amerisuninc.com or online at www.powersmartusa.com and click on Recall to Repair at the bottom of the page for more information.